The only thing I’m knitting these days is socks. Oh, and I did knit a dishcloth on Frank Harlow Day. But that’s it. Well, wait. I finished a Chevron Scarf a couple of weeks ago and I haven’t shown it to you yet. But still – right now – only socks. Work is stressful, there’s been lots of socializing and traveling and, while I have certainly been knitting, I haven’t been knitting anything new. Or challenging. That doesn’t mean, however, that what I’ve been knitting hasn’t actually been pretty awesome. 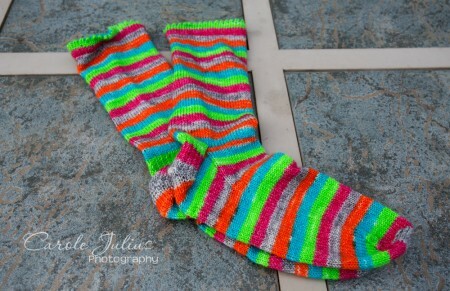 Like these new socks in Vesper Sock Yarn by Knitterly Things, now with 5 (5!!!) stripes. This color is called Electric Revolution and it’s fantastic. So bright and cheerful and so perfectly matchy-match from the tops. I don’t know how Julia does it but I’m awfully glad that she does. 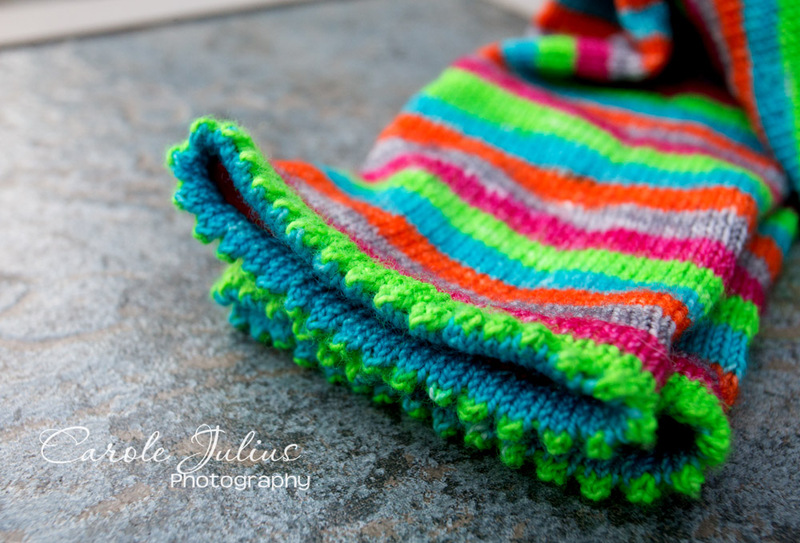 Also – a public service announcement – my friend and photographer extraordinaire, Gale, is having a giveaway on her blog for a weekend of classes at A Gathering of Stitches in Portland, ME. Go here and read Gale’s blog post and then go here and enter to win. Good luck! I am charmed by your stripe-y socks! (I think it’s the grey in the midst of the brights. . .) Maybe even enough to knit a pair for myself. . . They are so perfect! What kind of heel did you use? That stripe match is stunning. Thanks for the shout -out, Carole! 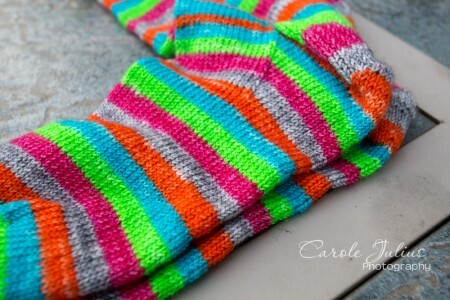 Beautiful socks. Those’ll be fun on a cold grey day. Love the socks!! Your stitches are perfect! I have some Vesper, but no sock mojo. If only I could be in Maine for the class. Was the matching intentional or serendipitous? The socks look amazing! Love those colors! And I love how you matched them so perfectly. Along with predicting and/or controlling the future and/or weather, I’d like to master, it would be really great to travel quickly through time and/or space. Heh. Oh, to be in Maine!! 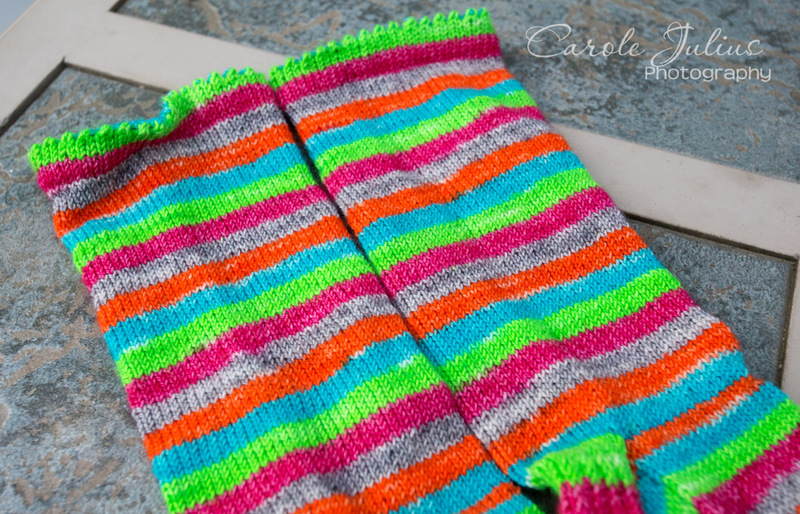 My sock mojo left the building ages ago, but those stripes! Julia is a wiz.